Grip It is very important to hold the racket correctly. How you hold the racket will have a major impact on the shot you are able to play and the power you can put into it. You have a choice of three main grips. 1. The forehand grip - Shake hands with the racket so the striking face points horizontally (not up or down). Rotate very slightly upwards. 2. The backhand grip - Hold the grip with your thumb on the back of the handle. The striking face will be pointing downwards. 3. The bevel grip - The grip resembles the backhand grip but with the thumb to the side of the handle along the ridge or beveled edge. The serve could be considered the most important shot in the game. While it is nice to have a huge smash or a deadly drop shot, you must be able to serve well to avoid attack and to surprise your opponent from the outset. Primarily used in the singles game, this is usually hit with the forehand grip. It should be as high as the court allows and right to the back of the singles court, dropping on the back line. Avoid serving too wide as this gives your opponent a choice of angles. Follow through with your racket swing and then prepare for the return. Although the low serve is more popular in doubles and mixed doubles, this serve is becoming more common in singles in order to avoid ever more powerful attacks. This can be forehand or backhand. More disguise is available in the forehand shot, although a good backhand serve gets you closer to the net and reduces the margin for error. Tip: You can practice your serve using a rope in the garden or a line on a wall instead of a net. Practice will pay huge dividends. The shot everyone likes to hit. Good technique, maybe surprisingly, will outweigh brute strength. Take the shuttle high and slightly in front of your leading leg - your right leg if you are right handed. Twist your hips as you strike and step forward to add power. Rotate your forearm outwards as you strike the shuttle. Visualise the shuttle hitting the very middle of the strings. Timing will add speed to your smash. This overhead shot should involve the same preparation as the smash and, to your opponent, should ostensibly appear the same. Just before impact the racket head speed is reduced. Use the mantra 'throw then slow' to invoke the idea of a fast arm movement which slows before the striking point. A good drop shot is taken as high as possible to create a steep angle. Fast drops are often employed in singles to prevent an easy net shot return as well as to reduce your opponents thinking time. Use the same step-through as you would for a smash and rotate the forearm outwards. You have two main options here - the high clear and the flat clear. The former is used more defensively, when you are leaning back and unable to play a more attacking shot. Because you may be unsighted and out of position, a high clear can be used to buy you time to get back in position. It should be played high and as deep into the opposing court as possible. The attacking clear can be played as a surprise shot. Although you should as a rule always hit down to attack, you may spot your opponent is too far forwards or caught 'square-on' and/or flat footed. By driving a clear hard and flat you may win the point outright or at least set up a weak return. Play your shot in the same way as the other forehand overhead shots. Tip: The step-through or kick-through is vital here to gain distance on your stroke. Twist your body for extra power. In a change from the forehand strokes, you should take the shuttle slightly behind your body. You may also find that playing the stroke with a slight 'L' shape to your arm is more ergonomically comfortable than a straighter arm. Use a fast arm swing to generate power and therefore distance on your shot rather than wrist action. You can use the same 'throw then slow' mantra to adjust the swing late on and produce a backhand drop instead. Use a bevel grip for this shot. Net shots can be played with the forehand or the backhand. With the racket just below shoulder height, a controlled lunge is made towards the net. The racket arm is extended in a line with your leading leg. 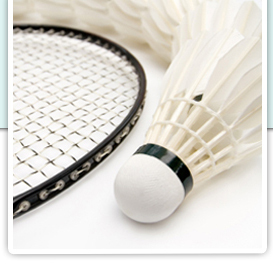 Net shots are best played at full arm's length so do not get too close to the net. Take the shuttle as high as you can and add a slight roll to the racket head to make the shuttle tumble. This will make it harder for your opponent to return. This is the only shot where it is permissible to hold the racket 'frying pan style'. A net kill can be played with a forehand or backhand grip. The aim of the shot is to finish off a rally without making contact with the net. This an especially important shot in doubles where the player at the front will be responsible for ending the rally. A short, tapping action is required with little follow through. This means subsequent tapping shots can be played if required because the racket is still in position. Where the shuttle is very tight to the net, a more sideways 'brushing' action is needed to avoid putting your racket over the net. Service returns should have the aim of putting your opponent under immediate pressure. Where possible, this means hitting downwards unless you have the opportunity for a surprise flat clear or you have been caught out and need to play a high clear or a lift. In doubles, a net kill or push is the traditional response although a good net shot to start off an attack is an effective variation. This will tend to force a lift from your opponent, assuming you have the net covered. Defending is best done with a backhand grip. With your feet in a shoulder-width stance and legs slightly bent raise your arm to allow the racket head to meet the shuttle and push upwards with your legs. You can flick the wrist but you will not need to generate a lot of power due to the speed of the oncoming shuttle - timing is more important. The strength of your opponents smash will determine how far back you stand. Be careful not to get pushed too far back as this opens up the forecourt and leaves you at risk from a drop shot. Singles is a game of speed. The faster you can get the shuttle down the better. While a clear may be an option, points tend to go in favour of the attacking player. Smashes, fast drops and tight net shots characterise a good singles game. Playing the shuttle on your opponent's backhand is a good tactic as many players have limited options here and cannot play a full court backhand clear to get out of trouble. This will allow you to come forwards and threaten the forecourt area. In short, defend side-by-side and attack front and back. There are many drills available to accustom you to the rotation of players. When a change of formation is required, the person in front will choose where to stand as they are unsighted whereas the person at the back can see and respond to their movement. The person at the net will nearly always finish the point. Unless you have an exceptional smash, you will not win points from the back of the court. Use attacking shots to apply pressure until the front player can end the rally. If you are evenly matched you can play level doubles, however most pairs will be set up with the woman covering the front of the court and the man the rear court. Part of mixed doubles tactics is to apply pressure on the weaker person in the partnership which is frequently the woman. Pressure can take the form of attacking shots or simply trying to manoeuvre the player out of position - primarily to the back of the court.